Christina Faye is an accomplished pianist now making her home in Toronto. Originally from Thunder Bay, Ontario, Christina discovered her love for the collaborative arts at the age of nine when she began playing for a local children’s chorus. Since then, she has worked with a vast number of student and professional instrumentalists, singers, orchestras, chamber groups, theatre and opera productions, as well as being an active teacher and solo performer. While in high school, Christina won several awards for piano and pipe organ performance excellence, as well as commendations for theory and harmony exams from the Western Conservatory and Conservatory Canada. In 2007 she earned a Bachelor of Music from Brandon University, and graduated from the Eastman School of Music with a Master of Music in 2009. She received generous scholarships to complete both degrees, as well as being awarded a Manitoba Student Bursary. 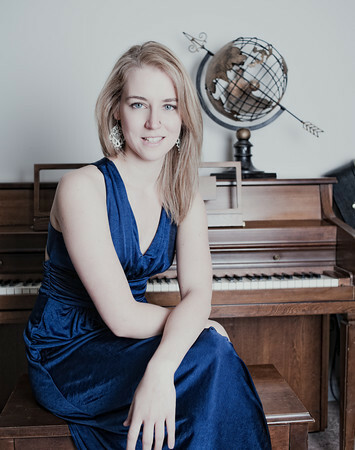 Christina has held collaborative pianist positions at several major summer music programs, including Opera Nuova, the Rocky Mountain Summer Conservatory in Colorado, Canadian Operatic Arts Academy and the Centre for Opera Studies in Italy. Christina has collaborated with innovative production team Out of the Box Productions for ‘Sound in Silence’ (‘09) and was music director for ‘Opera Erotique’ (‘10). Currently she is the music director at Christ Church Scarborough Village, and accompanist for the Toronto Welsh Male Voice Choir, as well as being an in demand collaborative and solo pianist. Christina is a member of the dynamic and successful ‘Yegada Piano Trio’ with cellist Mateusz Swoboda and violinist Edwin Huizinga, and piano/vocal duo ‘Seirínes’ with acclaimed soprano Adria McCulloch. In all of her collaborative and solo work, Christina explores and promotes contemporary Canadian music and seeks to bring new and exciting experiences to her audiences. When not performing, she teaches a small number of private students, volunteers at the Toronto Humane Society and experiments baking vegan desserts!